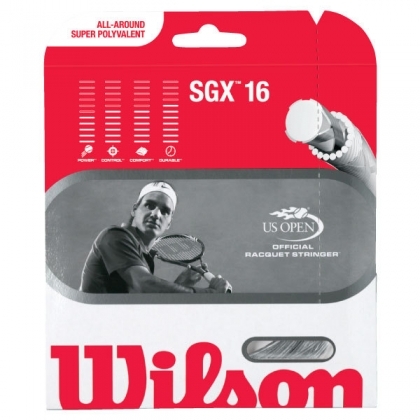 Improving the basic synthetic gut, the new Wilson SGX 16 Silver offers a crisp, comfortable feel by advancing the standard synthetic gut construction. The addition of bi-directional X-bands offers enhanced elasticity while allowing the string to retain the crisp feel characteristic of solid core synthetics. The additional bands in SGX 16 provide different flex characteristics, increasing the power and comfort. The large solid core is wrapped in the X-bands and then a layer of outerwraps is applied, resulting in a string with additional power and comfort compared to their basic synthetic gut. 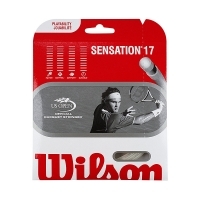 Recommended for players seeking an all-around string with additional power and a slightly softer feel without losing the crisp control.